Nixa Chamber Learning Cafe is held the 4th Friday of every month. If you would like to host an event at your business, please contact The Chamber Office. 715 W Mt. Vernon St. This event is for Nixa Area Chamber of Commerce members only. Show Me Christian County is hosting the Nixa Chamber Learning Cafe for the month of January at Nixa City Hall. 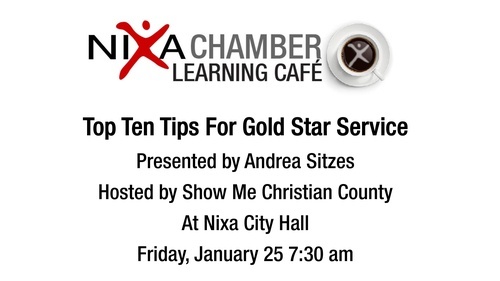 Andrea Sitzes will be presenting Top Ten Tips For Gold Star Service. Start your Friday morning with coffee, networking, and some great tips on gold start service.